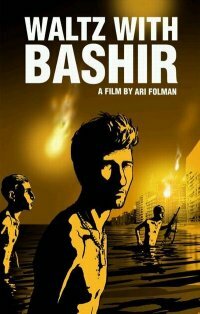 This Wednesday at the Avon is the Providence premiere of the Golden Globe award winning (for Best Foreign Film) and Oscar nominated movie “Waltz with Bashir.” This dramatically animated Israeli film documents the filmmaker’s journey toward discovering the truth about an Israeli Army mission he participated in during the first Lebanon War of the early 1980s that left him with a loss of memory about the events. The long-forgotten images begin to resurface as the director interviews old friends and comrades around the world. This wouldn’t normally be worthy of a post all by itself, but in this case the movie will be followed by a question and answer session with the movie’s influential Art Director David Polonsky. The community is fairly fortunate to have Polonsky here as an Artist-in-Residence at Brown-RISD Hillel doing a residency at the two universities for the next three months. This is an example of the power of our local educational institutions in creating culture here in Providence. Other communities may get the movie, but we get the movie AND public and educational access to the talent behind it. The ambitious calendar of Polonsky’s time in Providence can be seen here and his website here. A preview of the movie can be seen here and a review by the NY Times here. For the movie, doors open at 5 PM and tickets are first come first serve.